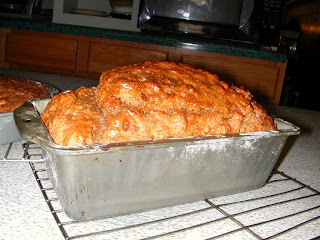 Abracatabby Arts: Peach Carrot Banana Bread! Now one dish she made that I did like was Meatloaf in bread... yes IN bread. She would get a huge loaf of Italian bread and carefully cut out a large oval from the top and scoop out the soft white bread leaving a large hollow. She would then mix hamburger, eggs, chopped onions and the few herbs and spices she used with the extracted bread crumbs and stuff it back in the hollowed out loaf.. baked in the oven for about an hour, replacing the "top" the last 15 minutes. Surprisingly this *IS* very delicious. Mom would let it cool for a few minutes and then sliced it. 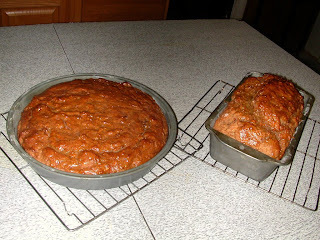 The outside bread is crisp and the meatloaf is moist.. slathered in catsup.. Now that was Good! And she made good deviled eggs.. So it's not like she didn't know how to cook at all. 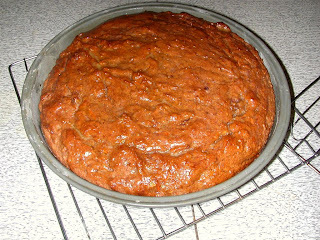 This morning my dear daughter and I made Peach Banana Carrot Bread,, with lots of ginger and cinnamon.. oh it smelled so good baking! Still does,, and I took pictures... Enjoy!